How do I add funds to my Steam Wallet? How do I view my Steam Wallet balance? What are Steam Wallet codes? I recently added Steam Wallet funds, but they have not appeared, what do I do? How do I redeem a Steam Wallet code? 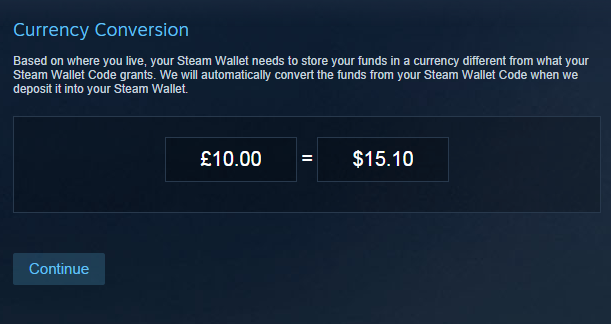 What currency will my Steam Wallet funds be in? Are there country restrictions on Steam Wallet codes? Can I redeem a Steam Wallet code that is in a different currency? What if my Steam Wallet code is damaged or unreadable? Can Steam Wallet funds be gifted, withdrawn, or transferred to another Steam account? Who do I contact for help with PayPal Wallet codes? Who do I contact for help with Steam Prepaid Card? I keep getting an invalid code error, what should I do? How do in-store promotions for Steam Wallet codes work? Log in to your Steam account. Click your profile name in the upper right hand corner and select Account Details. Click on "+Add funds to your Steam Wallet" to select an amount and proceed to checkout. Depending on where you live, you can find physical Steam Wallet cards that contain codes which can be redeemed into your Steam account at many electronics retailers, convenience stores, game stores and grocery stores. You can also purchase Steam Wallet codes printed directly on a receipt or delivered via SMS/text message or email through various kiosks, cybercafes and eCommerce websites. Codes are also available directly from PayPal. Please visit our Where to buy Steam Wallet Codes article to find the best local purchasing option nearest you. The current available balance will be listed in the upper right hand corner, below your profile name. Steam Wallet codes work just like gift cards which can be redeemed on your account for Steam Wallet credit and used for the purchase of games, software and any other item you can purchase on Steam. You can find Steam Wallet Codes at many retail stores across the World in a variety of denominations and different currencies. Funds added to the Steam wallet will be used towards the next purchase(s) to the Steam account. Once depleted, another form of payment can be used. I recently added Steam Wallet funds but they have not appeared, what do I do? If the updated amount is still incorrect, please contact Steam Support for assistance. Go to http://www.steampowered.com/wallet and sign in if you aren't already. You will need to create a Steam account if you do not already have one. Once logged into Steam, please enter your unique Wallet code that you received into the “Steam Wallet Code” field. Click "Continue" to redeem the credit onto your account. Note: If you have never used Steam Wallet credit on your account, you may be prompted to enter your current address to determine the correct currency. The value of the Steam Wallet code will be added to your account's Steam Wallet balance. The current available balance will be listed in the upper right hand corner below your profile name. When in the “Review + Purchase” step during checkout click “My Steam Wallet” as a payment method. The cost of the item you purchase and the associated tax will be deducted from your wallet funds. If you have never had a Steam Wallet balance on your Steam account, the funds will be added in the currency of the Steam store. If you have an existing Steam Wallet (regardless of the current balance), the funds will be added in your Steam Wallet's current currency. Steam Wallet codes typically do not have any country restrictions and can be redeemed worldwide (Note, some cards issued in Asia may only be redeemable in this region). Yes, however you will be prompted to convert the value of the Steam Wallet code to the currency of your Steam Wallet as shown below. The daily currency conversion rate will be applied. If a Steam Wallet code has been damaged or is otherwise unreadable, please contact Steam Support with a photo of the code attached to the ticket. Can Steam Wallet funds be gifted, withdrawn or transferred to another Steam account? No, wallet funds cannot be moved or withdrawn to a bank account. Once a Steam Wallet code has been redeemed on an account, the wallet funds are then tied to that account. If you would like to buy another user Steam Wallet funds, please purchase a Steam Wallet code. If you need help with a Steam Wallet code purchased directly from PayPal, please contact PayPal Help. Who do I contact for help with Steam Prepaid Card issued by WebMoney? If you need help with a Steam prepaid card purchased at convinience stores in Japan, please contact WebMoney Help. Any trade-in credit or other promotion offer by a retail store which modifies the value of your Steam Wallet code is handled by the retailer. If you have any questions regarding these offers or an issue with the Steam Wallet credit value received in one of these promotions, you will need to contact them directly. Post or search in Steam Discussions for an answer to your question.